To give an overview of Open Reading Frame (ORF) and its significance. To learn how ORF Finder searches for open reading frames in a DNA sequence using the standard or alternative genetic codes. To study how to perform a BLAST search for a particular ORF. DNA (Deoxyribonucleic acid) is the genetic material that contains all the genetic information in a living organisms. The information is stored as genetic codes using adenine (A), guanine (G), cytosine(C) and thymine (T). During the transcription process, DNA is transcribed to mRNA. Each of these base pairs will bond with a sugar and phosphate molecule to form a nucleotide. Three nucleotides that codes for a particular amino acid during translation is called as a codon. The region of a nucleotide that starts from an initiation codon and ends with a stop codon is called an Open Reading Frame(ORF). Proteins are formed from ORF. By analyzing the ORF we can predict the possible amino acids that might be produced during translation. The ORF finder is a program available at NCBI website. It identifies all ORF or possible protein coding region from six different reading frame. DNA (Deoxyribonucleic acid) is the genetic material that contains the genetic information for development and helps in maintaining all the functions in a living organisms.The information is stored as genetic codes using four different bases. They are adenine (A), guanine (G), cytosine(C) and thymine (T). In two strands of DNA, adenine always pair with thymine and guanine pair with cytosine. Each of these base pairs will bond with a sugar and phosphate molecule to form a nucleotide. The base pairing of DNA will result in a ladder shape structure of these strands which is called a double helix. RNA is differs from DNA only in 1 base pair i.e. in RNA it is uracil (U) instead of thymine(T). mRNA (messenger RNA) is a type of RNA which is formed from DNA transcription. During the transcription process, DNA is transcribed to mRNA in the nucleus and moves to the cytoplasm through the nuclear pores. This mRNA is translated to protein in the cytoplasm with the help of ribosomes. In mRNA, 3 nucleotides are considered at a time since a set of 3 nucleaotides (refered to as codon) codes for an amino acid. The region of a nucleotide that starts from an initiation codon and ends with a stop codon is called an Open Reading Frame(ORF). An initiation codon is the triplet codon that codes for the first amino acid in the translation process. The translation process will start only with the initiation codon, ATG which codes for the amino acid methionine. The translation process stops when it comes across a stop codon. There are three stop codons: TAA ("ochre"), TAG ("amber") and TGA ("opal" or "umber"). 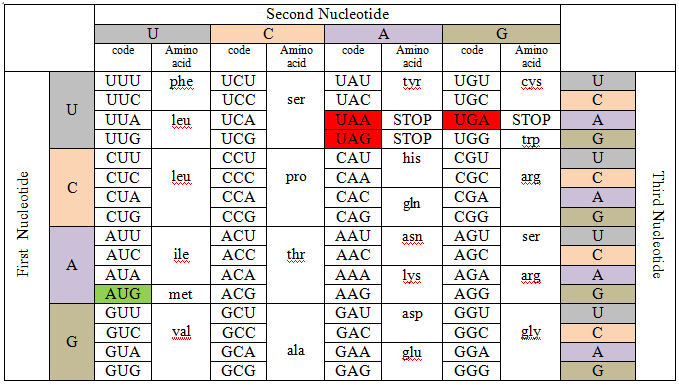 Any of these codons can stop the translation. Genetic codon can form 64 triplets(43) from the 4 nucleotides that codes for amino acids. Protein is formed from the ORF. 2. Divide the sequence into 6 different reading frames(+1, +2, +3, -1, -2 and -3). The first reading frame is obtained by considering the sequence in words of 3. The other 3 reading frames can be found only after finding the reverse complement. 4. Identify the open reading frame (ORF) - sequence stretch begining with a start codon and ending in a stop codon. By analyzing the ORF we can predict the possible amino acids that are producing during the translation process. The prediction of the correct ORF from a newly sequenced gene is an important step. Finding ORF helps to design the primers which are required for experiments like PCR, sequencing etc. The ORF finder is a program available at NCBI website. It identifies the all open reading frames or the possible protein coding region in sequence. It shows 6 horizontal bars corresponding to one of the possible reading frame. In each direction of the DNA there would be 3 possible reading frames. So total 6 possible reading frame (6 horizontal bars) would be there for every DNA sequence. The 6 possible reading frames are +1, +2, +3 and -1, -2 and -3 in the reverse strand. The resultant amino acids can be saved and search against various protein databases using blast for finding similar sequences or amino acids. The result displays the possible protein sequence and the length of the open reading frame etc.